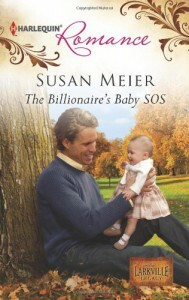 Reviewed at HarlequinJunkie.comBillionaire's Baby SOS by Susan Meier is the final book in the The Larkville Legacy series and Susan did a great job tying all the loose ends together and wrapping up this series beautifully. Matt Patterson is man who thrives on his Iceman, emotionless image. His whole childhood was built on lies and his hurts run deep. He learnt young that the only way to survive was to rely on one but himself. This quote from the book sums up Matt outlook of himself nicely: Yearning surged through him, but before he could capture it, it hit that wall of truth again. He was hard, cold. No matter how much he wanted to be the one who showed this child she was loved, that she didn’t have to be afraid, he knew he couldn’t. His family had taught him that people lied. His ex-wife had shown him that even when he wanted love he didn’t know how to accept it. When Matt's ex-wife passes away leaving custody of her daughter to him, he is shocked to learn that he Mr. Ice Man is now responsible for the well being of little Bella. Matt arrives at the adoption agency to find Bella being taken care of by Claire, he talks Claire into helping him get Bella settled at his home until he can find her a nanny.As Matt is forced to spend time with Claire and Bella within the confines of his home, his emotional resolve is tested and he slowly begins thaw out and connect with Bella and Claire on an emotional level. The idea that someone could love him just as he was stopped Matt cold. He peeked under the desk, at the little girl happily gurgling as if she’d found heaven. He scooted a little closer, looked at Bella with new eyes. Not as a baby who needed his protection, but as someone who would love him.Just as he was.Nobody had ever loved him just as he was.Nobody had ever loved him just as he was. Even Ginny wanted him to change. That was why they’d divorced. She’d wanted a more attentive, loving husband. He’d been as closed off as a man could get. And even when he tried to be more honest, more receptive, he couldn’t take those final steps.He peeked at Claire. “No matter what I do…she’ll love me?” Claire has been hurt baldy before and Matt is absolutely the wrong guy for her, but the more time she spends with Matt she realizes that beneath the Iceman façade is a warm and caring soul. A man who is afraid to love but will go above and beyond to protect and care for what is his. And the fact that Matt was willing to compromise and make an effort to reach out to his family and make amends so that Bella could have family around spoke volumes about his true character. I like re-union stories and books about second chances and Billionaire's Baby SOS was about all that and more, it was about taking chances opening oneself to love and happiness and reconnecting with family. I would definitely recommend reading the Larkville Legacy series.